along with an assortment of hearts, and I also layered a few more elements from the die set, along with a little stamped heart in Melon Mambo! Hmmmm, I wonder to whom I should send THIS card?! But I'm not sure if this little guy is saying grace or he's just plumb tuckered out, LOL! Enjoy your day! HRH has quite the royal family! I just L-O-V-E love this card LeAnne! I was wondering how you managed to get so creative with your framelits - what a cool swing card die! The bold panels of colour really appeal to me too; this card is so cheery, bright and fun! The tea party photos made me smile too - such fun! You could have fooled me--I totally thought you managed this swing card with SU Framelits! Either way it's a fabulously FUN card that screams C-A-S-S-I-D-Y!! Love it! What a fun card and a nifty die you were gifted!! I like the bit of sparkle you added to the vivid colors, super cute!! Don't know which doll was celebrating a birthday, but the hostess is mighty cute!! WOW! A super fun card. I don't know if I've seen one of these. I really like how you used the colors in the challenge on it and how you decorated both sides of the cutouts. CUTE card! What an awesome gift from your friend, such a fun die! You will get lots of use out of it. Too cute. I feel that way sometimes by the time I sit down for a meal. Cassidy looks so happy. What a pretty card - just perfect for a Valentine card. 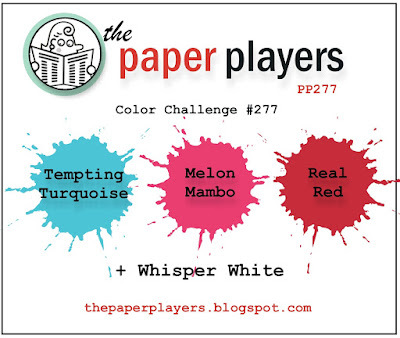 When I first saw the challenge I thought the Real Red would be difficult to incorporate, but you have done it beautifully here. That is a wonderful swing card die cut. Who is made by? Love that swing card! Pretty design and the added sparkle is perfect! Totally fun and original! What an awesome swing card, LeAnne! Perfect use of the colors. Cassidy's birthday party looks like lots of fun except for that last poor fella who looks like he has an excedrin headache, lol! Love the interest you created with the fold and cut!